This picture is from my eight year old niece, Sydney. 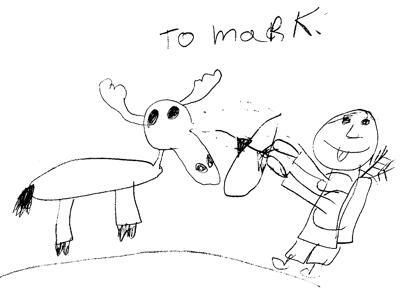 After she heard I had harvested a Moose using my bow she drew this picture. You can see in the picture I was really concentrating on the shot. Ha Ha!! Wow, your picture is awesome. I love it. That is the best picture we have ever seen of you.